The time is dark. It is a period in history that I never thought I would live to see, but as I write this post there is a pervasive malaise throughout the entire world. People are unsure of what to expect next. It is not my intent to espouse any particular political viewpoint in a perfume-related blog post; I am merely referencing the times in which we are living. This darkness that seems to enfold us—even during daylight hours—reminds me of a discussion launched by one of my professors when I was studying at seminary. Here’s the gist of it: While horrible things happen in the dead of night, darkness can also yield to happiness.I think it does us good, during times like these, to remember this. As we journey together through this very long night in our world, it is my hope that we will remember the good things that happen in the dark: Lovers come together, babies are born, prayers are delivered to the Creator, stars shine beautifully against a velvet backdrop, and our bodies rest and renew. 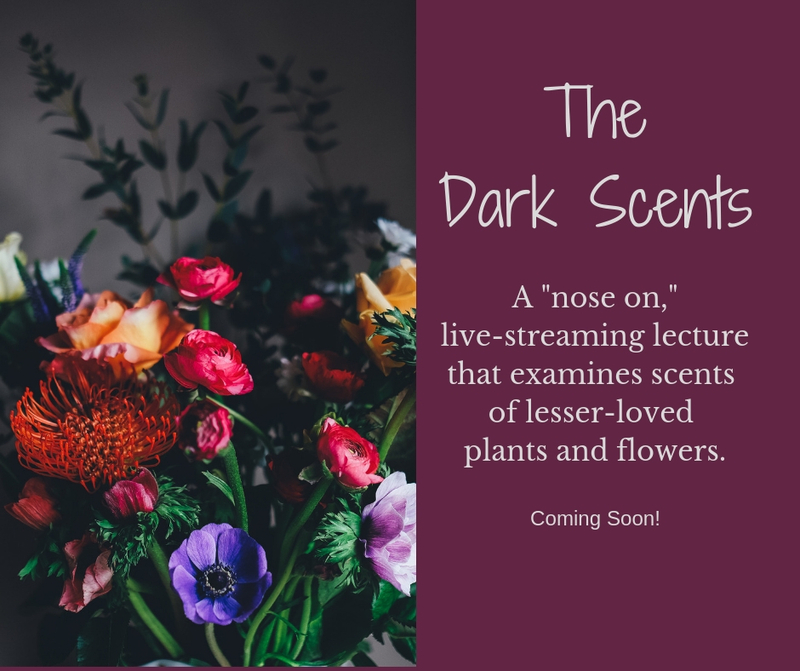 Last year, I was asked if I would be interested in delivering a lecture on “The Dark Scents.” As much as I love creating and talking about all-natural scents, at the time it didn’t seem like something that would fit into my schedule. Lately, however, I have been thinking a lot about the dark scents that are used in my artisan perfumes. These dark fragrances are the heavy, natural extracts such as patchouli, oud, labdanum, and oak moss, for example. On their own, they are not always so loved; however, add a drop or two of a dark fragrance to a happy blend of scents—such as one featuring pink grapefruit, yuzu or bergamot—and the perfume takes on more depth and breadth. It becomes more interesting and develops a personality. Dark scents offer you an “experience,” not a clean-smelling mask. They’re real, exotic and animal-like. One perfumer even describes wearing dark scents as akin to having a tail hanging out from beneath your dress. These darker scents are typically used as base notes in perfumery. Think of them as accents—like a teaspoon of vanilla extract is to chocolate chip cookie dough. In the meantime, I will leave you with this thought: If the dark—whether it be dark scents, the dark of night or those dark periods of our lives—causes us to slow down, scares us a little and shakes us to our core, is that really so bad? At least for me, it is during the dark times when I realize what is most important in my life. As I end this post on a cold, dark night, one of my favorite songs—referencing my favorite scent—comes to mind. As we approach Christmas Day, I hope you will recognize that even during the bleakest of times—hope comes. Lo! how a rose e’re blooming. Darkness may attempt to rob us, but our hearts continue to dance on—all the more hopeful and joyful. As an artisan perfumer who works with light and dark scents, the analogy is not lost on me. I have experienced firsthand how the lovely fragrance of rose becomes deeper and richer when nuanced with the dark scent of patchouli or oak moss. Wishing you a meaningful and Merry Christmas.